How hard could it be? I’d already tried tandem skydiving and hang gliding, so I was excited about trying paragliding in Peru. I had my first inkling of trouble when we leapt off the cliff in Miraflores, Peru. But instead of taking flight, we started to descend. This was the first of several white-knuckle episodes in the Miraflores sky. 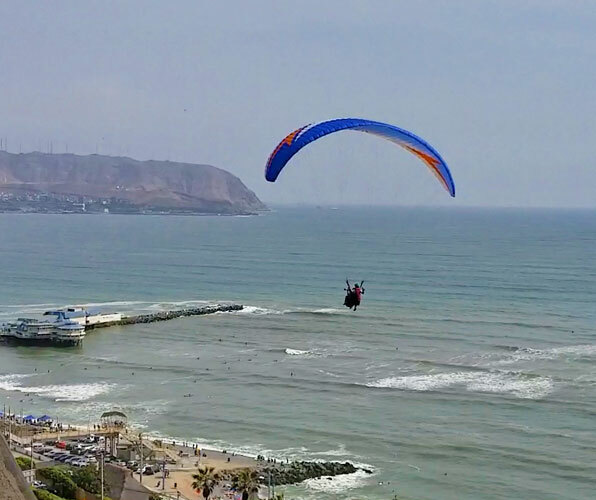 Miraflores is an affluent residential and shopping district of the Lima Province in Peru with upscale hotels, restaurants, bars, and nightclubs near the malecón – the seaside boardwalk. During our tour with AdventureSmith Explorations, my friend Alison and I stayed in a luxury boutique hotel a couple of blocks from the water, sampled delicious ceviche and parmesan scallops on the pier, strolled through the Guell-inspired Parque del Amor, and explored the historic colonial Plaza de Armas. But no trip would be complete without satisfying my thirst for at least one adrenaline activity. “Paragliding isn’t one of our offered activities because it’s a little too dangerous,” said Todd, my AdventureSmith contact. Paragliding is an “extreme sport” in which a parachute canopy is attached to a person’s body by a harness in order to allow them to glide through the air after jumping off a cliff or some other high platform. The shape of the canopy wing is maintained by the suspension lines. Controls held by the pilot connect to the edges of the wing, and are used to steer and to adjust speed. Statistically, paragliding is as safe as driving, so undeterred, I made my way to the cliffs and booked a tandem paraglide on my own. The feeling of being able to fly without wings is just too irresistible. You know… YOLO. 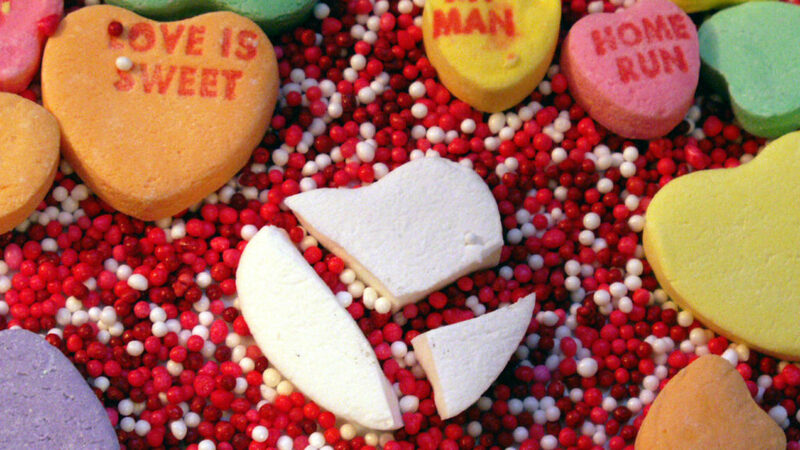 A few minutes later, that 20-year experience was first-and-foremost in my mind. We started to run off the cliff, which is NOT easy when you’re strapped tightly to another human being and trotting sideways, with several crew members pushing you along. It took everything I had not to do a face-plant. “ABORT!” I heard one of the crew yell. We stopped right before leaping off the precipice. Apparently, the airflow that causes the aerodynamic forces – aka lift – that would allow us to support our own weight had collapsed. At our second attempt in the low wind condition, the wing was spread out, and as we launched forward, it inflated behind us. And then off the cliff and up we went, and that thrill of soaring filled me as I settled into the harness. I noticed that we did not get up really high, though. We were almost parallel with the cityscape, perilously close to the cliffs. 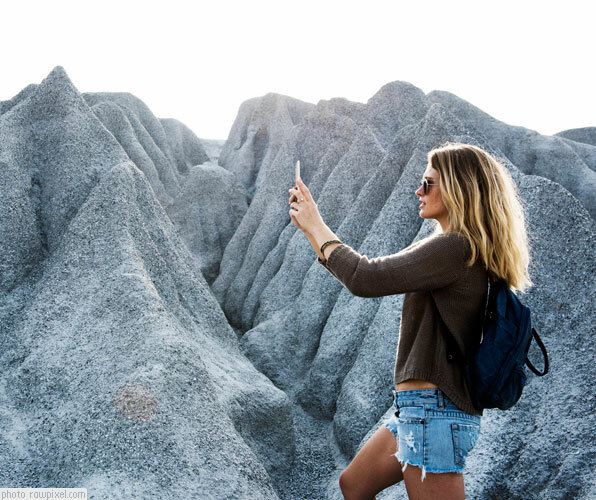 Staying aloft in light wind conditions is commonly called scratching because you are very close (almost scratching) the cliff in order to maintain altitude or stay up. The whole flight was supposed to last around 10 minutes, but it seemed longer than that. I started to hear noises of frustration, sighing, grunting from the pilot. Several more minutes, turning manoeuvres, and more disgusted noises ensued. I watched as we slowly drifted to the beach. Straight ahead was a patch of green grass, which he was steering towards. There were no crew members to catch me coming in, as would have at the top of the cliff. Fighting panic, something in my psyche told me to “go with the flow” and roll in the direction of the fall. We hit the ground with a thump, and momentum pushed me forward. I curled up and rolled in the direction of the thrust. The pilot tumbled on top, then over me, before helping me to my feet. I gave him the stink-eye, that visage of disapproval that I reserved only for when my children were misbehaving in church. “Yeah, but we’re down here instead of up there,” I said, pointing to the cliffs high in the distance. 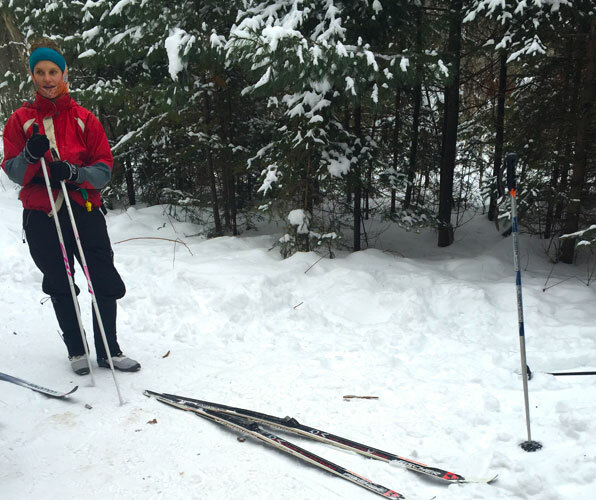 He retrieved his cell phone and called someone to bring us back to the starting point, where Alison was anxiously waiting for me. Perhaps I should have listened to Todd? Maybe, but I tend to be a bit of a risk-taker. Did the pilot deserve my facial wrath? Probably not – he can’t control nature and although it was a hard landing, I was unhurt. 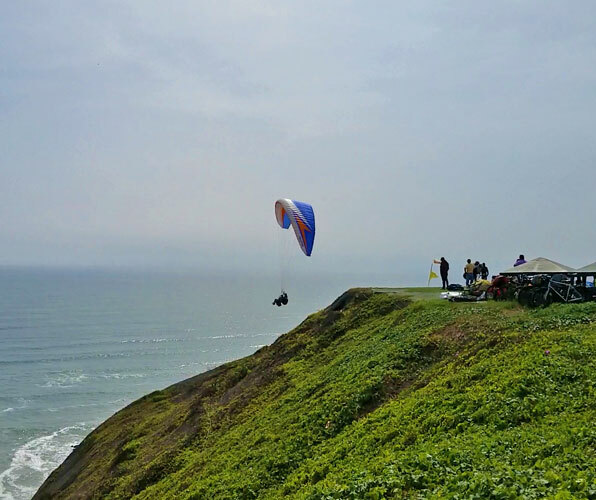 Should you try paragliding in Peru? By all means, yes! 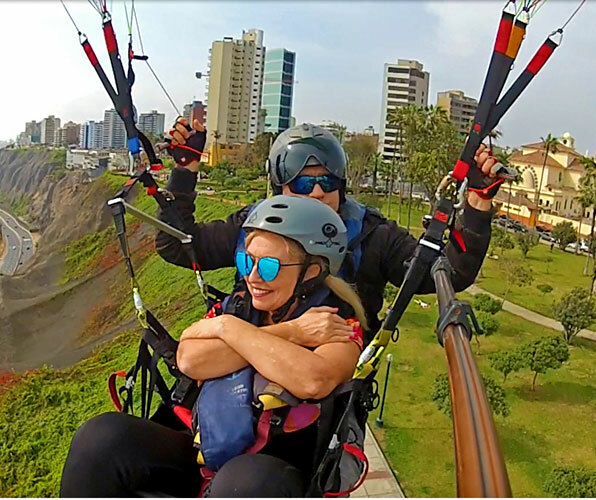 Disclosure: The author was honored to be the guest of AdventureSmith Explorations during her stay in Lima, but as always, the opinions, reviews and experiences are her own.